Slow and steady wins the race, once more! 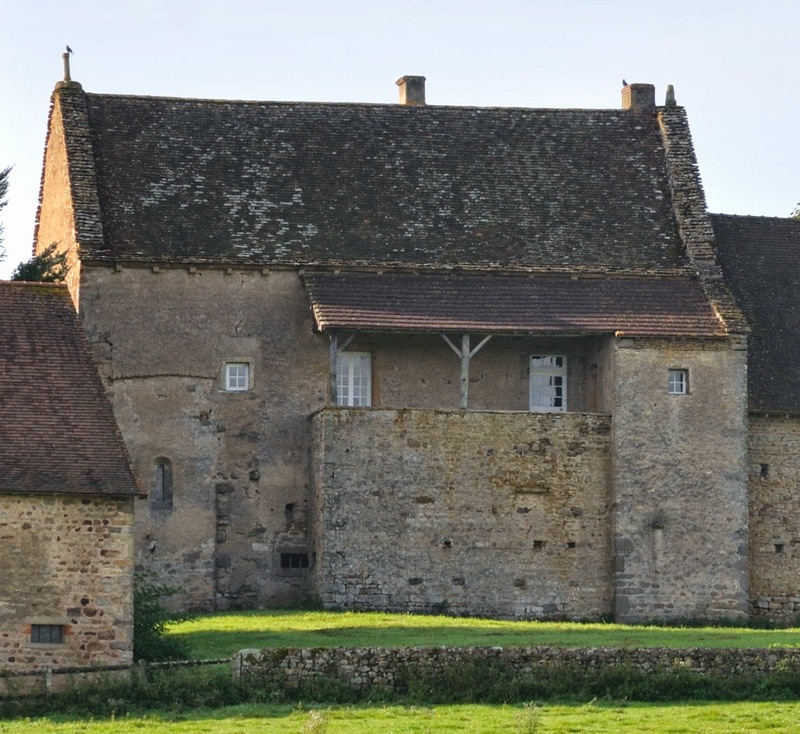 In a previous blog I mentioned that I might have found the former church in Ciergues, a hamlet near Donzy-le-National. In the meantime I have made an interactive map of Burgundian Romanesque churches, and this "church" is indicated on that map as well. The menu on the left of the map itself contains a list of alphabetically ordered place names. We still regularly drive through Ciergues, and every time I look to see whether there is somebody home to acknowledge the fact that the shed I had found was indeed the church. Recently we drove through the hamlet again, coming from the north, and this time we stopped at the first cluster of three that make up Ciergues. And what we had never spotted, due to the angle the road makes, we spotted now: behind the shed with the buttresses another building was hidden, consisting of two parts. The panorama photo shows the shed left in the foreground; the building behind it can be seen on the right hand side. A consultation with our export revealed the following: the left hand part of the building in the background had church potential. 3. the modillons (corbels) under the lower edge of the roof. The first search action took place in October 2012, the second a year later. Did I hear someone say that I give up easily? As a non-Catholic it always surprised me to see, apart from the usual Christ, Mary and Joseph statues, the statue of a small guy with a rather pointed nose dressed in "modern", i.e. non-biblical clothing in Catholic churches around here. Asking an American Anglican Reverend (!) 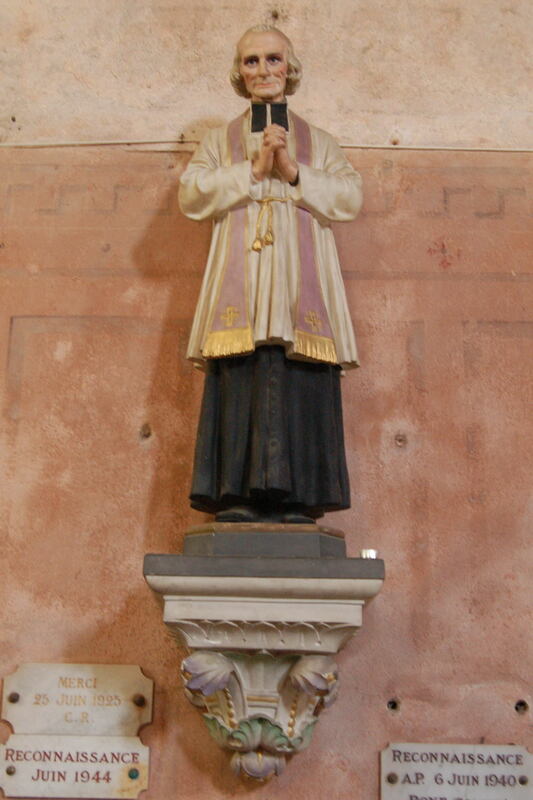 whether he knew who this could be, he came up with the name of Jean-Baptiste Marie Vianney, in England also known as Saint-John Vianney, the patron Saint of all (Catholic) parish priests. On a lovely day we drove off to Ars-sur-Formans, a village in Ain (01), for us on the other side of the Saône. Very soon we stumbled upon road signs pointing to "Village du Saint-Curé" (village of the Saint-Priest) - the real name of the village was hardly ever displayed on those signs - and it did not take long to find the place. From the Michelin travel guide I had learned that Ars is an important place of pilgrimage, and not only for priests. Each year Ars is visited by half a million worshippers. The whole village breathes Saint-Curé. His house is converted into a museum, the old village church has been replaced by and partially incorporated into a new basilica (1862), which houses the remains of the priest (a rather tasteless grotesque building by architect Pierre Bossan who also built the Notre-Dame-de-Fouvière in Lyon), there is a museum with wax effigies of the priest during the various stages of his life, in short, the former parish priest still "lives" in this village. Inside the Basilica one can see the priest's body, and for the heart of the man a separate chapel has been built. 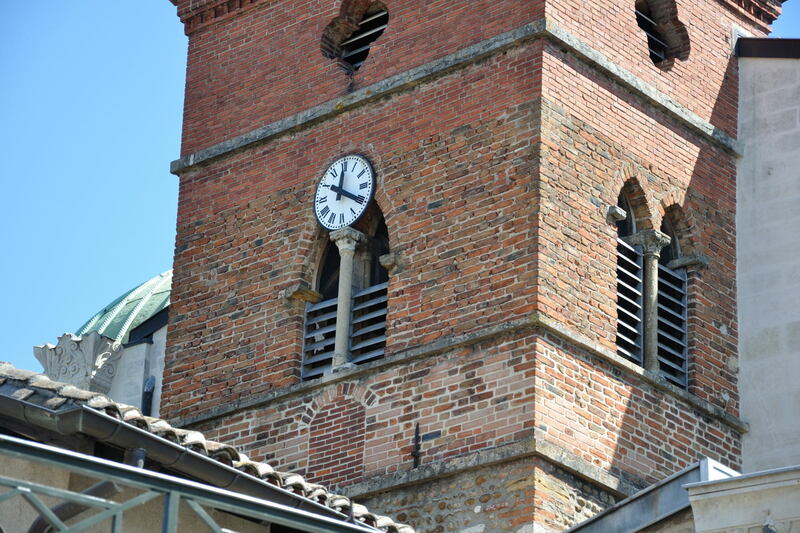 There are, in the bell tower of the "old" church, still six old Romanesque columns and capitals, originating from the cloister of a partially demolished priory church, that of Salles-en-Beaujolais. After all this rather modern church-spotting we decided to visit the very interesting 11th Century Saint-André in Saint-André-de-Bâgé on our way back, still on the same side of the Saône, just opposite Mâcon. The apse of this church boasts an interesting arcade, a number of the columns have elaborately carved capitals, the portal of the church is beatiful as well, in a word, this church turned our visit to Ain into a great succes. Between Ars and Saint-André we stumbled upon some 12th Century churches, those of Biziat, Saint-Julien-sur-Veyle and Sandrans. 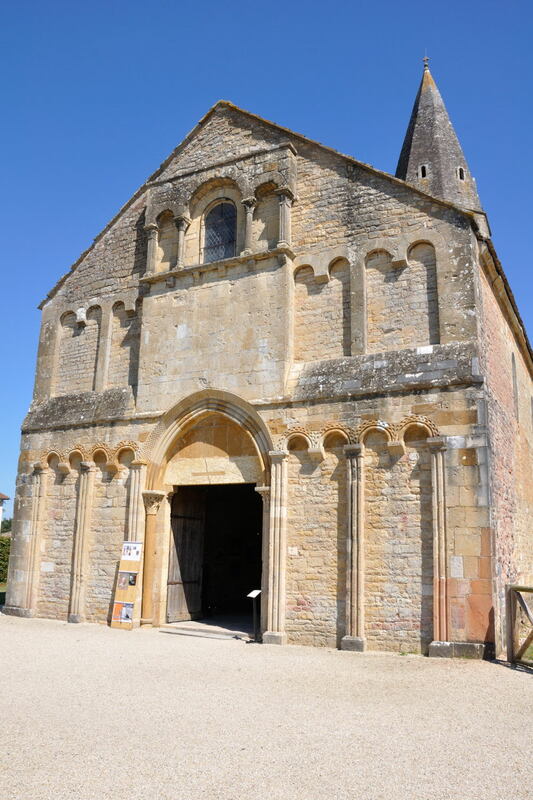 Only the church of Saint-Julien-sur-Veyle was open to visitors. 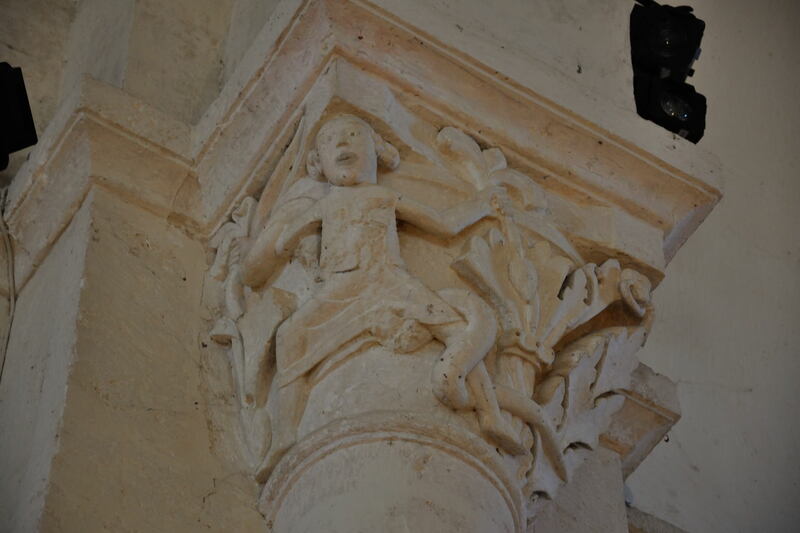 A concise overview of Romanesque churches in Ain bordering Saône-et-Loire can be found on this map. Saint-André-de-Bâgé is only a day trip away from La Tuilerie de Chazelle. 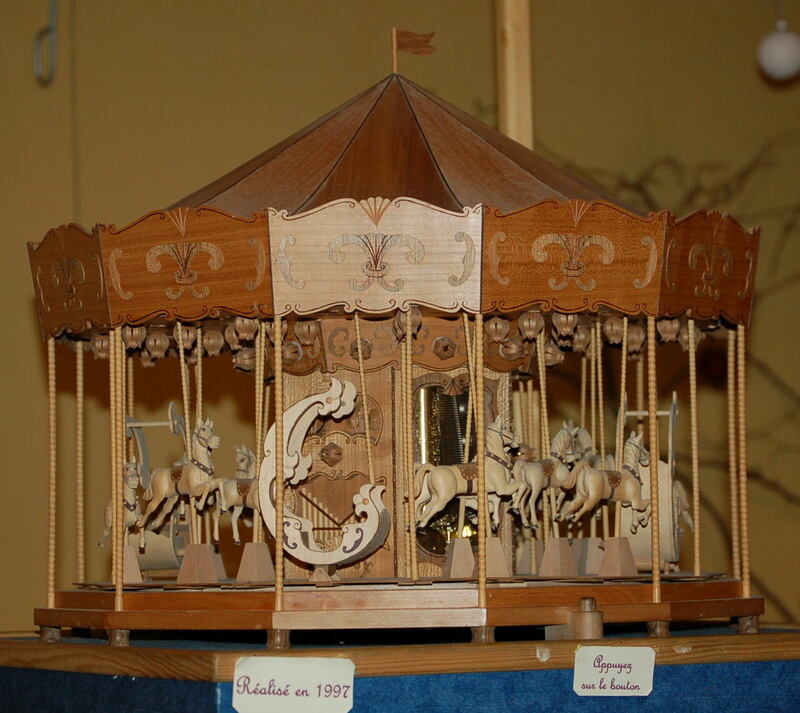 Recently we visited an artisan in Bonnay, who produces miniature wooden things. Not only does he make tiny little toys and elaborate knickknacks, very popular in the sixties to be displayed in type cases, no, next to his workshop he has a small museum where he displays all the items he has made in the past. He keeps one specimen of everything he has ever fabricated for this museum. One of the cutest things for sale at the moment is a tiny workbench of not higher than 2 inches, of which the vice actually can be operated by a thin wooden handle. Apart from items for sale he has a beautiful collection of music boxes, a merry-go-round, a clock (of which the only part not made of wood is the protective glass casing), a large wall cabinet with many small doors carrying the names of professions; opening a door will bring a violin maker into action, etc. etc. 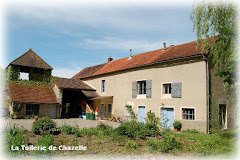 This museum is certainly worth a visit, and to get an impression of the work of Joël and Maryse Dedianne, click here. 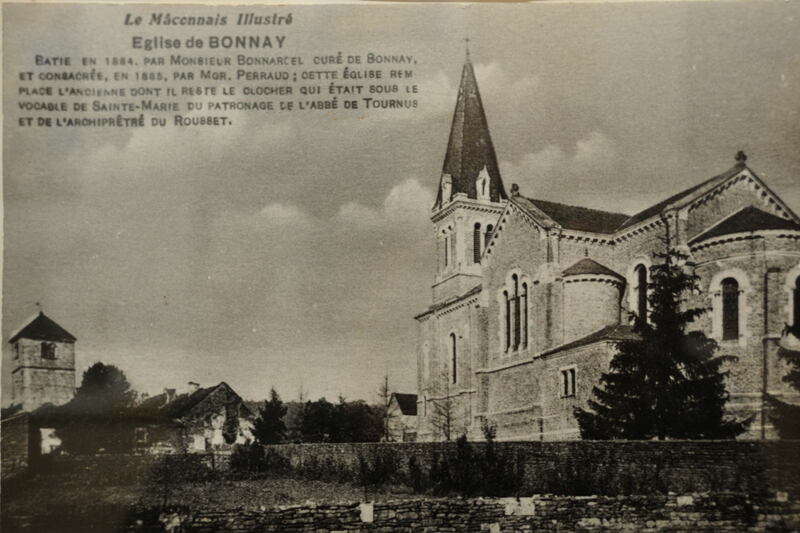 One of the walls of the museum is covered with information about Bonnay and surroundings. A picture of a piece of wall in opus spicatum caught my eye, the only part still existing of the original Romanesque church of Bonnay. Next to it a blow-up of an old picture postcard was displayed, showing the bell tower of that church next to the new church. The tower still existed around 1935. I am now 100% convinced that the piece of wall, about which I once wrote a blog, indeed belonged to a church one day! Bonnay is at cycling distance from La Tuilerie de Chazelle.